Hobbies : I love to dance and hang out with friends and love listening to Jesse McCartney music!!!! HE IS GOING ON TOUR!!!!! Christina Longo Bostons #1 Jesse McCartney Fan"oh that body is music to my ears because Boston's #1 fan is right here"!!! In August with Backstreet Boys. But it's only in the USA. I wish he was coming to the UK. I'm going! And meet and greet pass. So excited.. Hope I don't pass out. That's awesome!!! Have fun!!! 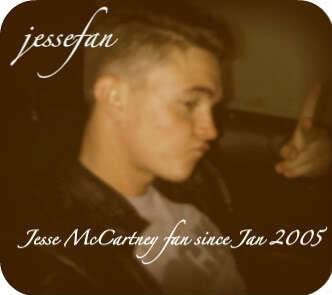 I hope you take a pic with Jesse! So, you can post it on here for us to see. So, I hope you don't faint! Angie2005 wrote: Lol ill post it! THATS AWESOME THAT YOU WILL MEET HIM AGAIN! You guys are so lucky!! Have fun though!! I wanna see pictures! does anyone have any idea on how many people are doing the meet and greet? i feel like nobody really would spend that much $$ to see him (I did, I'm just wondering in general)...and if anyone is seeing him in STL let me know! quote= Quida411* I'm not goin to be able to go to the concert. I will take the chance to go. But if I don't then I will go to the waterpark and beach down in Chesapeake, Maryland.